"I actually came up with this standing in the kitchen, deciding on what to eat. It was phenomenal! I paired mine with bacon-seared corn and brown rice. If you need a sauce for dipping, try a sweeter sauce (caramel-infused BBQ sauce comes to mind)." Whisk egg, egg white, heavy cream, and garlic salt together in a small bowl. Combine flour, cocoa powder, and cinnamon sugar in a separate small bowl. Place half of the chicken into the egg mixture; let sit for 2 minutes. Remove chicken from egg mixture and place in the flour mixture, turning to coat all sides. 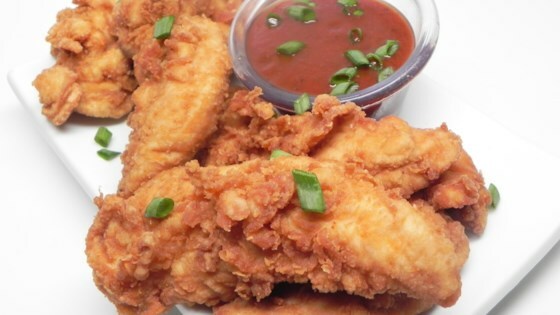 Place the coated chicken pieces onto a paper towel. Repeat dipping the the remaining chicken in the egg mixture and the flour mixture. Gently place the first batch of coated chicken in the hot oil; fry until chicken is cooked through and floats to the top, about 5 to 8 minutes. Transfer cooked chicken to a plate lined with fresh paper towels. Repeat frying with the second batch of chicken. Let chicken rest for 5 minutes before eating. You can test the heat of the oil by gently dropping a small amount of egg into the oil. If it stays on top and begins to cook, the oil is ready. No I didn't make any changes. I will make it again. I plan on adding more coco and cinnamon sugar.